Since we're doing some work on the house, I won't be having a Halloween party this year. 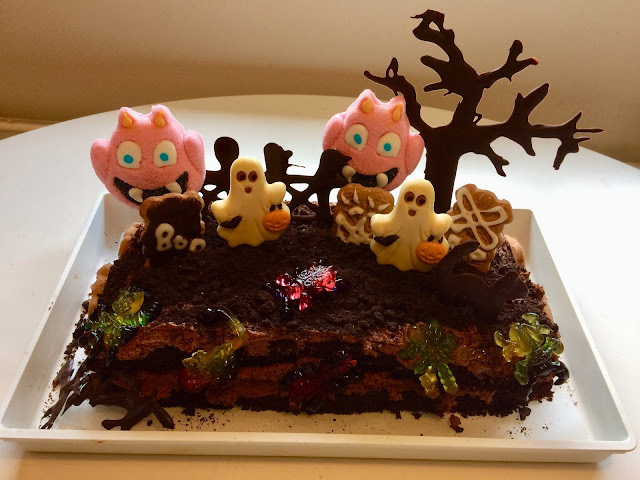 I didn't want to miss the fun entirely so I made this graveyard cake for game night at a friend's house. Not bad for a first attempt. It was downright tasteful before I added the pink monsters and the jelly bugs, but more is more, right? The tree, fence and cat I made myself by drizzling dark chocolate on parchment paper with a teaspoon, which was surprisingly easy. Mistakes don't matter too much, because once the chocolate hardens you can just snap off the extra bits. It's that time of the year again when the trees shed their glorious autumn leaves and everything turns grey, dark, and dismal. Fortunately Linnanmäki amusement park had its annual Carnival of Light again this year. We didn't go on any rides this year (because of The Babe), but the cotton candy popcorn and hot chocolate and the gloriously creepy haunted carnival ambiance were enough for me. Here are a few pics if you missed the festivities. This was The Babe's favourite. She kept pointing and going "Ka" which is her word for "duck" (ankka in Finnish). I love this old carousel! We also visited Amos Rex, the new museum in Helsinki city center. The exhibition by TeamLab, a Tokyo-based interdisciplinary art collective, is just mind-blowing. My favourite was an installation that had a sort of tropical fantasy world that was constantly on the move, and it was interactive, so when you touched the wall, flowers blossomed, and you could create your own fantasy animal that then became part of the installation. The Babe had the best time chasing after them. It's running until January 6 if anyone wants to check it out. I'm not sure what this is called in English, but in Finnish it's karhunsammal, bear's moss, because it's a nice, soft place for a bear to take a nap on. Are you looking at the trees or are they looking at you? Do you dare venture off the beaten path? I made it to the book fair this year, yay! There was all kinds of weird stuff for sale, like this beautiful book called The Witch Doll and a practical guide to telepathy. Writing When You Have Small Children: Mission Impossible? As you might have noticed, juggling writing and parenting is an issue I've been struggling with since The Babe (who is now The Toddler, my how time flies!) entered my life. It started even before that, during the pregnancy: I just couldn't write through the nausea and exhaustion, and even when I felt okay, there were a million things to take care of before the baby came. And when she did arrive, most days were just a struggle to cope. Suffice to say, barely any writing got done during the first year. But, things are looking up! Behold, posts have appeared on the blog fairly regularly for the past few weeks. Granted, not three a week, but even one or two a month is progress at this point. 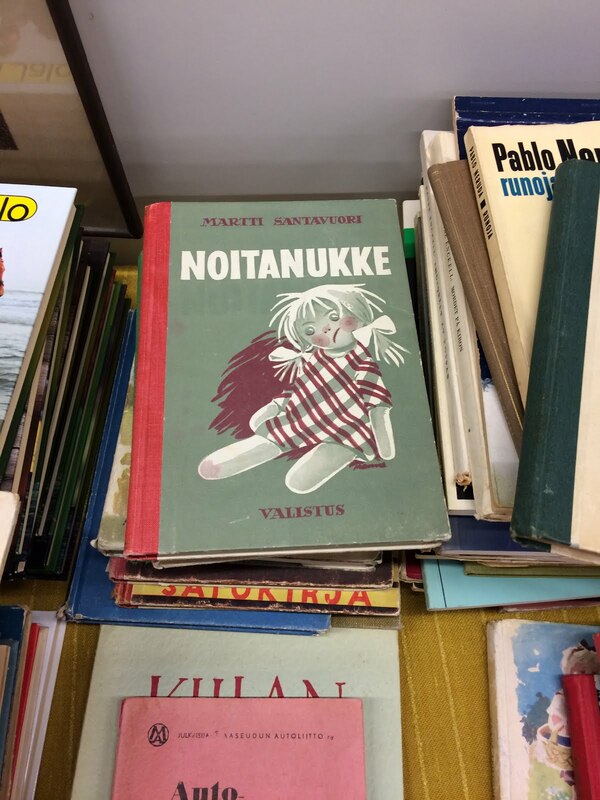 I'm finally reading The Kalevala, the Finnish national epoch, something I've needed to do so I can finish two short stories, and I'm actually making steady progress on the first of those stories. I managed to edit and send a story to the Portti competition. I wrote a bit of flash last week. This is all good. So, how did I get back into a writing routine? I tried several things, some more successful than others. Second, I tried to get my husband to watch the baby for an hour every night so I could write. This, too, proved better in theory. Something always came up and I felt guilty for prioritising writing over family time or chores or whatever. I could also hear the baby through the closed door and usually caved if she was being very fussy. Third, I decided that I needed to get away from home altogether to get anything done, so every weekend I'd get my laptop and head over to the library or a coffee shop for a few hours of uninterrupted writing time while the baby hung out with her daddy. This was also a good strategy and something I will be doing regularly in the future. Fourth, and this one is a double-edged sword, I'm trying to sneak in some writing after The Babe is asleep for the night. That's actually when I'm writing this post. The trouble is that my own sleep gets cut short, so it's not ideal, and I tend to get carried away and stay up until after midnight if the writing's rolling along nicely. My advice to new parents with writerly ambitions is to grab any writing time when you can, where you can, even if it's just fifteen minutes. Fifteen minutes a day adds up to almost two hours a week, which isn't too shabby. You can also do a lot of planning and thinking while hanging out at the playground or washing dishes, which saves you time when you're writing. Find what works for you. And most important of all, be kind to yourself. Writing might have to take a backseat for a while. Sometimes life just happens. Writing might be a priority, but it's not your only priority, and it will always be there even if you need to take some time off. The Proust Project is nearing completion, finally! I actually finished The Captive/The Fugitive in January and due to severe sleep deprivation at the time my memories are not exactly in 3D surround sound so bear with me if I get some things mixed up. . . 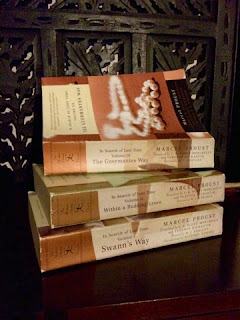 The Captive was the first volume of In Search of Lost Time to be published after Proust's death, and boy, does it show. I've grumbled that Proust could have used an editor before, but with these volumes the passages of gorgeous description and witty insights into the human condition were even fewer and farther between. It doesn't help that as the volumes deal with themes of possessiveness and jealousy and Marcel's love/hate relationship with Albertine, the whininess quotient goes throught the roof. Oh, the drama! Marcel spends the first book obsessing over whether Albertine is cheating on him with her lesbian lovers and alternitively whining about how bored he is with her. Proust then unceremoniously offs Albertine (spoiler alert, I guess? ), and the next book is spent wallowing in the loss of this Great Love (Hah!). When compared with the description of the loss of Marcel's grandmother earlier in the story, the loss of Albertine feels quite hollow, but I'm not sure if that's intentional. Something about the structure feels off, too. After hundreds of pages of very slow going, suddenly a whole bunch of major plot events are shoved into a few paragraphs like an afterthought. I've pretty much loathed Marcel from very early on, but if you didn't despise him before, this volume will send you over the edge with his casual misogynism and the crap he puts Albertine through. (That passive-aggressive letter!) I was genuinely happy that Albertine finally left and put us all out of our miseries. All in all Proust's view of love is pretty depressing, all lust and obsession and pathological jealousy. There is a positive, though. I finally understand the structure Proust uses. (Yes, there is a structure!) He takes a scene and then expands on it in the way memories work, via free association. I felt that this was the easiest to spot in the bit where Marcel looks at his sleeping lover and contemplates his situation. I'll have to try this approach for myself soon, maybe in a short story. Only one more volume to go! I might actually finish this year, after seven years! Ready to hear about slush reading? Okay. 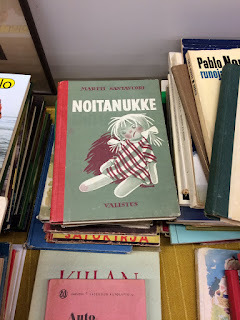 Here's a bit about the competition first: Nova is an annual Finnish-language writing competition held by the Turku Science Fiction Society, the Finnish Science Fiction and Fantasy Writers Association, and the Science Fiction Culture Cabinet at the University of Turku. It's aimed at new writers (pros are excluded, so if you've won the Atorox award, the Portti writing competition, or published a novel-length work, you're no longer eligible). 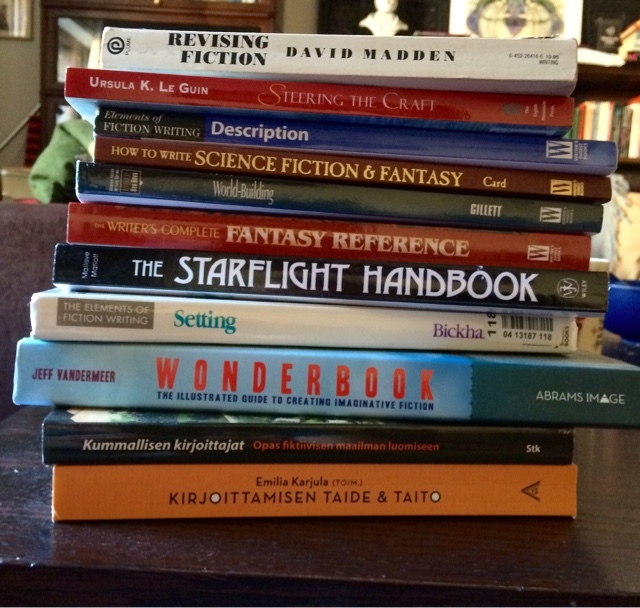 I've submitted stories for the competition for quite a few years, like most Finnish spec fic writers. I won second place in 2016, so that's probably why I got asked to slush read. Like most slush reading, this was an unpaid position, so why donate your precious time, you might ask? Well, first of all, it's fun! 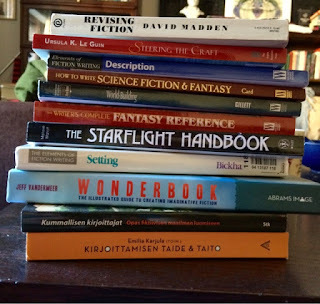 You get to meet interesting people and it's nice to give back when you can, since a smallish group of fandom actives work hard to make things like Finncon possible, host reading and writing groups, and arrange genre-flavoured writing courses, for example. Second of all, it's a golden opportunity to see the editor's side of things and learn how to stand out from the slush pile. So how much work is involved? This year there were 134 entries, 24 of which made it into the judges' pile. One thing I like about the Nova competition is that a part of the prize is a critique from the judges. The finalists who don't make it into the top ten get a critique from the slush readers, so we each did three or four critiques in addition to the reading part. 134 stories sounds like a lot, but the page limit for the competition is twenty and maybe half the entries ranged from a few pages to eight or ten pages, so while I did read for several hours each week, it wasn't that bad. For those interested in the process, the way we went about it was to score every short story on technique (grammar, punctuation, voice, style, etc.) and storytelling (structure, plotting, theme, character, world-building and so forth) and then worked out an overall score from one to five. The four of us also wrote a short critique that summed up the story and touched on any special merits or major flaws; these made writing the finalists' critiques a few months later a lot easier, and it was very instructive to compare and contrast what the other slush readers and the judges had written about the stories. And what did I learn? What made a story stand out from the slush pile? For me the major factor was originality. There were many competently written stories that felt quite familiar to someone who's read widely in the genre. Most failed to make the cut in the end. Personally, I'll overlook a certain number of technical issues for an idea that feels fresh. Before you despair, it's not impossible to come up with an original idea; for many of these stories all it would have taken was an extra half hour of plotting before starting to write. First, take the time to ask yourself what the reader expects. If you just write the idea as it first comes to you, your mind is probably trying to take you down familiar paths, but if you take a moment to think about the major turning points you might come up with something else entirely. And it doesn't have to be something completely new: a fresh spin on an old trope is original, too. Second, do try to utilise more than one idea, you'll add more depth and originality. Do pay attention to the submission guidelines and proper story formatting. If you're not sure how to use quotation marks in dialogue, grab any book from your bookshelf and check. And paragraph breaks are nice, too. Don't use a weird font in a tiny size with single spacing. It's really annoying to read. Even if you don't get disqualified, do you really want to piss off the slush reader even before she's read one word of your story? Are you sure you've submitted a complete story? A surprisingly large number of entries read like novel excerpts or a part of a larger whole, usually stopping at the first plot point. If it's too long for the competition when you finish, check that you've started the story when the story actually begins. Nova is a speculative fiction writing competition. Is the speculative element integral to your story? If the speculative element could be easily deleted and the story would still work fine, it's probably not integral enough. And no, "it was all a dream" and "it was all in his/her head" don't count. Do have somebody read your story before you send it in. You'll definitely improve your chances with a few thoughtful edits. Okay, there's my two cents, I hope you found them useful. Congratulations to all of this year's winners and to everyone else, thanks for entering and letting us read your stories. If you didn't make it this year, please don't get discouraged. No story is ever wasted, and success at competitions is definitely not everything. The best thing you can do is keep writing and try to get feedback on your stories, you'll get there eventually. I won't go into specifics concerning any single competition entry here, but if you have a general question, I'll be happy to answer if I can. Editing, Editing . . .